The five-year deal Stefon Diggs and the Vikings agreed on could be worth even more than $72 million. Here's a look at what else is in the contract, and how much of the package is guaranteed. The numbers for Stefon Diggs’ new contract with the Vikings are in, and here’s the upshot of the wide receiver’s deal: He will need to continue to produce if he wants to earn the biggest annual salaries in the deal. The Vikings, in keeping with their pay-as-you-go approach, packed all $40.07 million of Diggs’ guaranteed money into the deal between now and 2021, giving him a $15 million signing bonus and guaranteeing his base salaries of $1.907 million this year, $8.9 million in 2019 and $10.9 million in 2020. 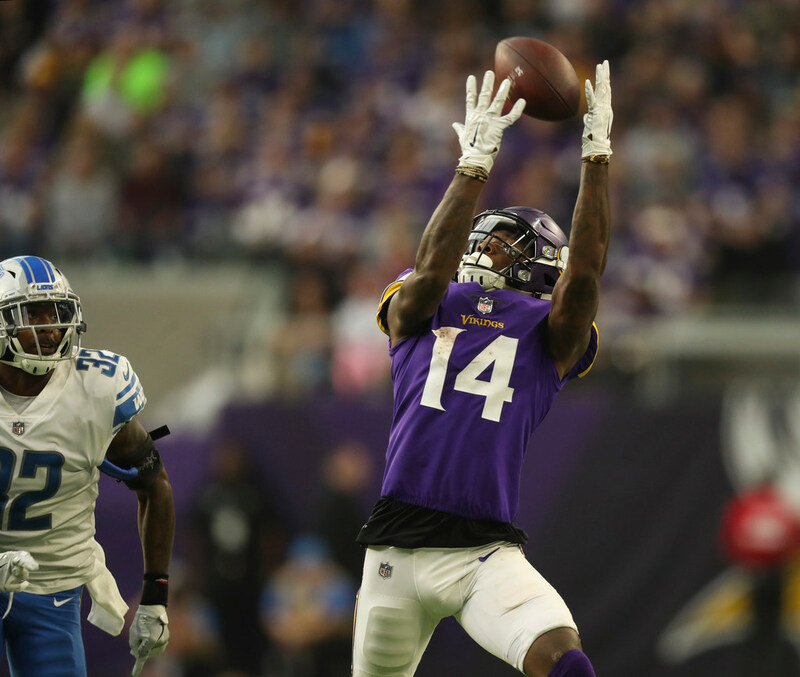 The Vikings guaranteed $3.3 million of Diggs’ 2021 base salary, which is worth a total of $11.4 million. It remains to be seen how much of Diggs’ money is fully guaranteed now, and how much will require him to be on the roster at a later date; the Vikings will often guarantee a certain amount of money against a catastrophic injury for the time being, but require the player to be on the roster at the start of a league year to lock in his guaranteed money for that season. In any case, it will be incumbent upon the 24-year-old to keep growing; his $11.4 million base salaries in the final three years of the deal come after all but $3.3 million of his guaranteed money is gone. Diggs’ $15 million bonus will amortize against the cap over each of the next five years, meaning the Vikings won’t have any dead money in the final year of the deal. He can earn annual workout bonuses of $100,000, and make $31,250 in roster bonuses for each game he’s on the active roster, up to a total of $500,000 per season. The Vikings also gave Diggs the opportunity to earn base salary escalators in 2022 and 2023; his deal is worth $72 million now, but could earn him up to $81 million through escalators and incentives. Minnesota has $9.822 million in salary cap space left for 2018, and Diggs’ deal carries cap numbers of $12.5 million next year and $14.5 million in 2020. We’d assumed a cap number of $13 million for Diggs in this piece, and $2 million of other expenses for the Vikings this year; adjusting those calculations with Diggs’ actual numbers would give them around $13.1 million in cap space for 2019, with the ability to push it to $18.6 million if they decline safety Andrew Sendejo’s $5.5 million option. There’d be more money available, of course, by restructuring the contracts of other veterans, though the Vikings will inevitably have a few other roster spots they need to take care of along the way. Nonetheless, they’ve still got enough money to do another sizable contract for another player on the roster, if they apply their usual resourcefulness and find a willing partner. The determination they’ll have to make, as we talked about in our initial analysis of Diggs’ deal, is whether they want to do one more big deal, and which player is worth the expense.